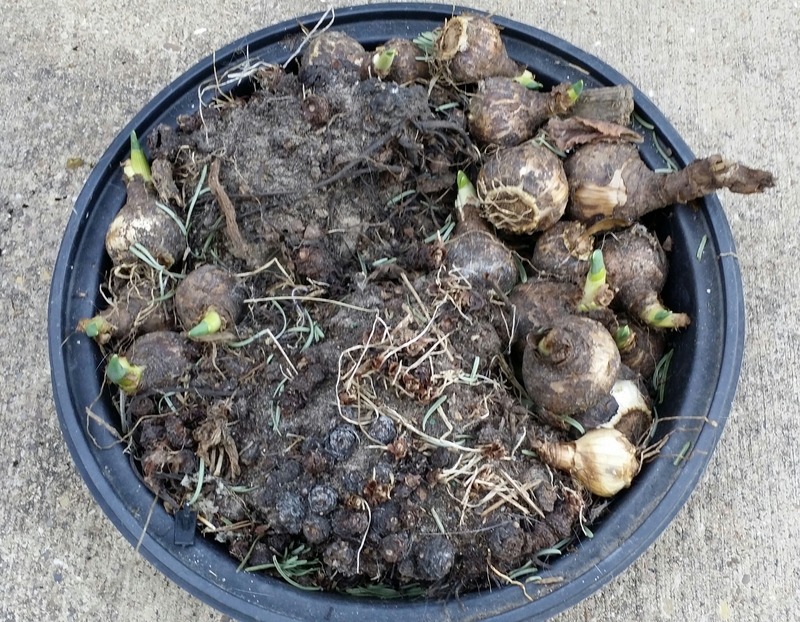 Last July, I dug several clumps of daffodil bulbs — narcissus x golden Dawn (pictured left) to save for pass along plants as well as to re-plant in a few new areas. This year, I decided a few need to accent a corner rose bed. Late December to Early January is a great time to plants these bulbs. 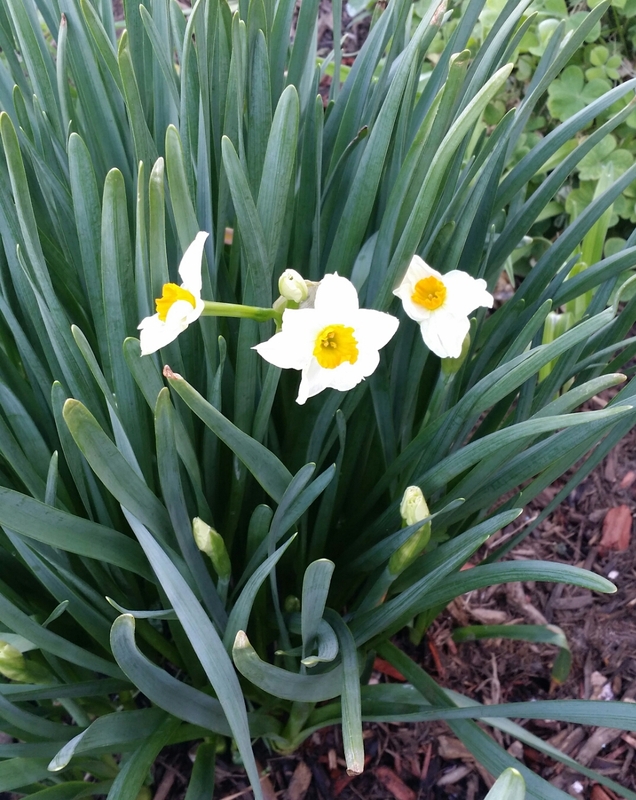 While there are a number of varieties of Daffodils (or Narcissus), few tolerate the heat experienced in zone 8b Texas. I’ve had great luck with narcissus x golden Dawn growing, blooming and proliferating each year for at least the past 6 years. Other Narcissus varieties that grow in this area are; Narcissus jonquilla, Narcissus ‘Grand Primo’, and Narcissus x odorus. 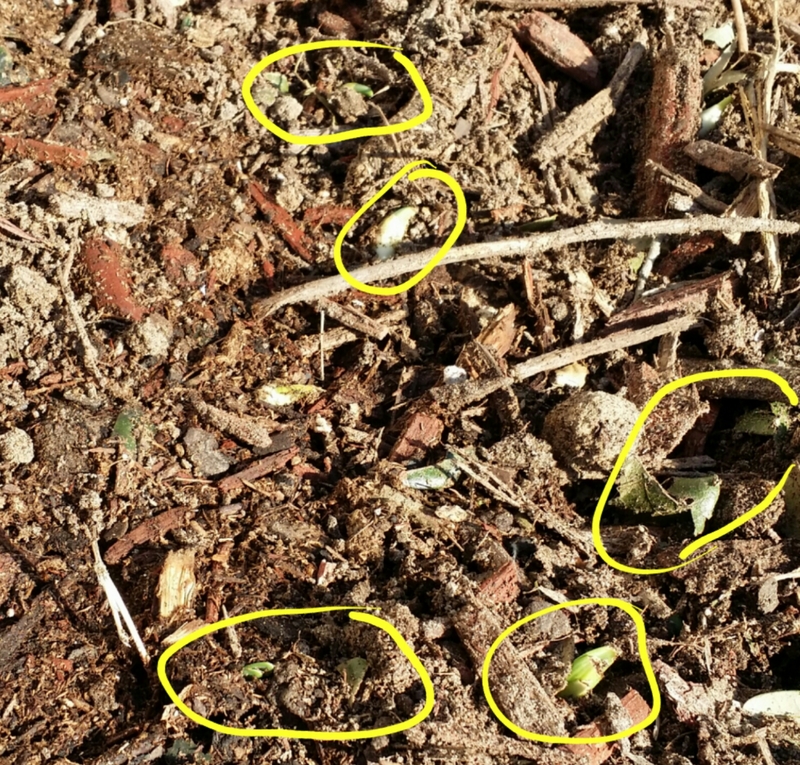 Step 1 Dig bulbs after all green parts above ground have died back (performed late Fall, 2014). Store the dug bulbs in a cool, dry place (I kept mine on the back patio since it is shaded most of the winter). I covered the bulbs with hay mulch — just make sure that herbicides were not used on the hay. It is best to select and use hay that is second or third cut if the use of herbicides in the hay meadow is uncertain. If you are just starting with daffodils in your garden, purchase from a reputable gardening center — or ask a friend for pass alongs! Step 2: Determine where to plant the bulbs. I usually plant these well before the green foliage begins to appear at the top of the bulb, so I’m behind for this year (bulbs have sprouted — see photo). After observing a corner bed receives sunshine year around, that bed was targeted for a freshening up! Dig just deep enough so that when soil is replaced, it is just high enough to cover the neck of the bulb (mulch can be placed about an inch higher after the bulbs are in the soil). The green tops are visible above the soil (see photo; yellow circles highlight the green tops). Adding mulch helps control weeds and insulates the bulbs from sub zero temperatures. Step 4: Wait for the color to appear in the garden! Patience goes along way, these gems will reward you with a colorful show when there is little else in bloom.